Dinosaur Comics - October 19th, 2011 - awesome fun times! –But it seems that with planning you could, I don't know, AVOID the bad things? 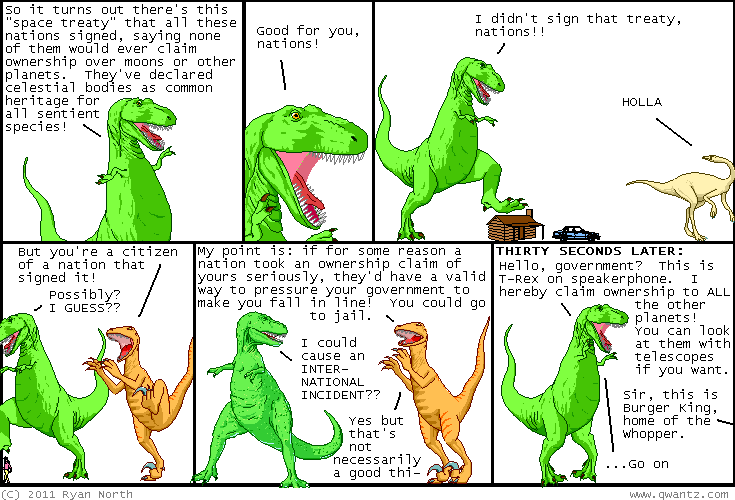 October 19th, 2011: Last year there was a Dinosaur Comics missed connection that ended okay and inspired a Feel Free To Talk To Me If I'm Wearing A Dinosaur Comics Shirt Day. EARLY WARNING: I'm gonna call December 19th, 2011 as this year's official Feel Free To Talk To Me If I'm Wearing A Dinosaur Comics Shirt Day! Here's what I said the first time around that still totally applies! If you're single and you'd like to meet someone who maybe reads the same comic as you, THIS IS YOUR CHANCE. If you've got one of my shirts, wear it, and if you don't have one, you can keep an eye out for someone who does! And if something awesome does happen, please email me about it: it'd be totally amazing if everything works out. Okay, so the problem is - what if you're happily in a monogamous relationship or if you're NOT looking for anyone or whatever? You can not wear your shirt on the special day, or if you do, you can politely let folks down easy as I'm sure you're used to doing, and I say this because every reader of my comic I've ever met is attractive. Not even a joke there. It's kinda crazy. And please note that this is not "Feel Free To Be Totally Creepy Around Me, That's Awesome Day". This is just a day where an small group of clothing articles has been semantically overloaded for a self-selected group of people to say "Hey, talking to strangers can be hard, but here's your opening, and here's maybe a hint that I'm not against meeting someone new." Good luck everyone!! Here's what to wear and what to keep an eye out for. Everyone find happiness, OKAY??? I'll remind you again as we get closer.